During the Golden Age of Piracy (1700–1725), legendary pirates like Blackbeard, Bartholomew Roberts, and Charles Vane commanded mighty ships, terrorizing any merchant unfortunate enough to cross their path. Yet two of the most famous pirates from this age served on a third-rate pirate ship under a second-rate captain, and they never held an important position on board such as quartermaster or boatswain. 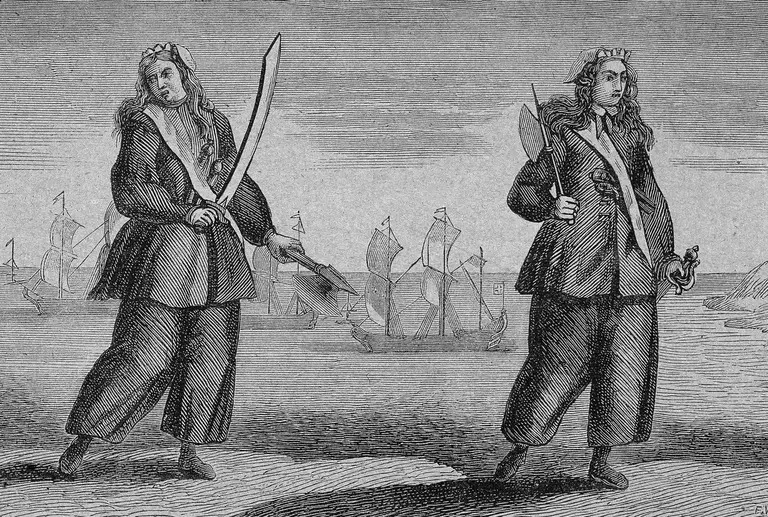 They were Anne Bonny and Mary Read: bold women who left behind the stereotypical domestic chores of women at the time in favor of a life of adventure on the high seas. Here, we separate fact from myth in regards to two of history’s greatest swashbucklerettes. Mary Read was born into complicated circumstances. Her mother married a sailor and they had a son. The sailor was lost at sea about the time Mary’s mother found herself pregnant with Mary, by another man. The boy, Mary’s half-brother, died when Mary was very little. The sailor’s family did not know about Mary, so her mother dressed her as a boy and passed her off as her dead half-brother in order to get financial support from her mother-in-law. Apparently, the scheme worked, at least for a while. Anne Bonny was born out of wedlock to a lawyer and his maid. He grew fond of the girl and wished to bring her into his home, but everyone in town knew he had an illegitimate daughter. Therefore, he dressed her as a boy and passed her off as the son of some distant relations. Like most of the pirates of the era, Bonny and Read made the conscious decision to become pirates. Bonny, who was married and living in the Caribbean, decided to run off with Calico Jack Rackham and join his pirate crew. Read was captured by pirates and served with them for a while before accepting a pardon. She then joined an anti-pirate privateering expedition: the would-be pirate hunters, most of whom were former pirates themselves, soon mutinied and returned to their old ways. Read was one of those who actively convinced the others to take up piracy again. Although they’re arguably the most famous real-life female pirates, Anne Bonny and Mary Read are far from being the only women ever to take up piracy. The most notorious was Ching Shih (1775–1844), a one-time Chinese prostitute who became a pirate. At the height of her power, she commanded 1,800 ships and 80,000 pirates. Her rule of the seas off of China was nearly absolute. Grace O’Malley (1530?–1603) was a semi-legendary Irish chieftain and pirate. According to Captain Johnson, who knew both Read and Bonny, the two met while both were serving on Calico Jack’s pirate ship. Both were disguised as men. Bonny became attracted to Read and revealed that she was really a woman. Read then also revealed herself to be a woman, much to Bonny’s disappointment. Calico Jack Rackham, Bonny’s lover, was allegedly very jealous of Bonny’s attraction to Read until he learned the truth, at which point he helped both of them cover up their real gender. Rackham may have been in on the ruse, but it apparently wasn’t much of a secret. At the trials of Rackham and his pirates, several witnesses came forth to testify against them. One such witness was Dorothy Thomas, who had been captured by Rackham’s crew and held as a prisoner for a time. According to Thomas, Bonny and Read dressed as men, fought with pistols and machetes like any other pirate and were twice as ruthless. She said that the women had wanted to murder Thomas to prevent her from eventually testifying against them. Thomas said she knew them at once to be women “by the largeness of their breasts.” Other captives said that although they dressed like men for battle, they dressed like women the rest of the time. Rackham and his crew had been active in piracy on and off since 1718 when in October of 1720, Rackham was discovered by pirate hunters led by Captain Jonathan Barnet. Barnet cornered them off the coast of Jamaica and in an exchange of cannon fire, Rackham’s ship was disabled. While Rackham and the other pirates cowered below decks, Read and Bonny remained on the decks, fighting. Rackham and his pirates were swiftly tried and found guilty. Most of them were hanged on Nov. 18, 1720. Bonny and Read were also sentenced to hang, but both of them declared they were pregnant. A judge ordered their claim checked out and it was found to be true, a fact which automatically commuted their death sentence. Read died in prison shortly thereafter, but Bonny survived. No one knows for sure what became of her and her child. Some say she reconciled with her rich father, some say she remarried and lived in Port Royal or Nassau. The story of Anne Bonny and Mary Read has captivated people ever since their arrest. Captain Charles Johnson featured them prominently in his 1724 book, ” A General History of the Robberies and Murders of the most notorious Pyrates,” which certainly helped his sales. Later on, the notion of female pirates as romantic figures gained traction. In 1728 (less than ten years after Bonny and Read’s arrest), noted playwright John Gay wrote the Opera Polly, a sequel to his acclaimed Beggar’s Opera. In the opera, young Polly Peachum comes to the New World and takes up piracy as she searches for her husband. Female pirates have been part of romantic pirate lore ever since. Even modern fictional she-pirates like Angelica, played by Penelope Cruz in Pirates of the Caribbean: on Stranger Tides (2011) owe their existence to Read and Bonny. In fact, it’s safe to say that Bonny and Read have had a far greater impact on popular culture than they ever had on eighteenth-century shipping and commerce. Cawthorne, Nigel. A History of Pirates: Blood and Thunder on the High Seas. Edison: Chartwell Books, 2005. Rediker, Marcus. Villains of All Nations: Atlantic Pirates in the Golden Age. Boston: Beacon Press, 2004.